A while back several of my “rough and rowdy” friends and I were sitting around a backyard table filled with bar-b-cued brisket, sausage, pork ribs and “smoked” chicken, served up with all the trimmings. Some of our Ark-La-Tex group were naturally enjoying their favorite adult beverage along with this scrumptious meal. This was a good “down home” southern neighborhood get together, regularly held near Huffines or McLeod on someone’s patio or possibly out near the backyard fence. It may even occasionally be a “tailgate” party way out somewhere on the “back forty.” It all just depends. Rufus said, “Maybe they joined the army and over the years are becoming seasoned into mature short haired, responsible adults with higher goals and aspirations.” Then Junior, licking the bar-b-cue sauce from his fingers said, “I really miss all the hippie jokes we used to hear. At least they let the Aggie jokes rest for awhile." As we closely evaluated the subject, everyone present was aware of the group of people Bubba mentioned. The Hippie’s free and loosely knit, uncommitted lifestyle was well known. His/her general appearance with baggy clothes, long unkept hair, a mostly forever unshaven face and a Volkswagen bus were a given. Most times going unclean, dirty and disheveled was common. Many wore various assortments of jewelry, colorful beads and headbands; plus gray and white US Kid Tennis Shoes. Or were they red, blue, green or black and white. The Hippie presence and ways were fairly common and highly noticeable during the decades of the1960's through the 1980's. Now many folks today aren’t aware of some other types of “Hippies”. Junior told us he had never heard about these next two and I am not surprised at all. HIPPIE #2... A very personal woman thing; a reference not everyone is familiar with. It will never come to concern many women, but others it will come to concern greatly. My mother had experienced it long before I came to know her, as did my older sisters, especially as they matured and bore children. An ever present part of evolution, it could happen to anybody. Even your Aunt Matilda or Hillary; Mildred or Jezebel. SO, PLEASE, NO OFFENSE HERE TO ANY PRECIOUS LADY. A FACT OF LIFE IT IS! I sincerely apologize. Writing this “blip” is just a part of my little story today. Of those affected, many women will experience what they themselves call “getting hippie”. This could also be loosely referred to as “the middle-aged spread.” And it is not a bad thing. Not at all! It is a time of life when excess weight is accumulated in the hip region of some women, thus causing them to get a little “hippie”. “Hippie” is a condition many an attractive young lady very much wants to avoid. Some will avoid this undesirable condition much longer than others. Though for many it is inevitable, coming sooner or later. A healthy, active, low-fat lifestyle and regular aerobic exercise will help stave off this “hippie” for a while... It is a serious hit the gym sort of thing, you know. HIPPIE # 3....The Bovine...is a cow called “Hippie”. This is usually a domestic animal often times someone’s own private milk cow. She has been “hipped”. (Yes, a hipped cow.) Hipped by a slowly closing pasture gate or maybe a stall gate. It most often shows only on one side of the cow, the hipbone on the affected side. Someone has negligently allowed a gate to “trap” or snare one side of the cow. Scenario: The cow is headed toward the barn or stall to be milked or fed. She is moving at a fast walk or trot. The gate has been opened for her passage. But it hasn’t been properly secured with a chock-block, prop or tied back with a wire, to stay open. As the cow proceeds through the gate it slowly closes, moved either by wind force or gravity. It now closes enough to hang on her protruding hipbone. Her head passed through with plenty of room, but by the time her hip passes, space becomes too tight. The gate hangs solidly on her hipbone and causes a fracture. The cow gets “Hipped”. A severe “hipping” can definitely fracture the cow’s hipbone. It can make the broken hipbone stick up much higher than normal, unmistakably. Forever thereafter, a trained eye knowing what has happened will notice it right away. One side is higher than the other side. Any farmer, cowman, rancher or cowboy knows exactly what a “hipped” cow is. Now you will too the next time you have a chance to notice this condition, often caused by careless haste or negligence. Thank goodness it is rather a rare condition. 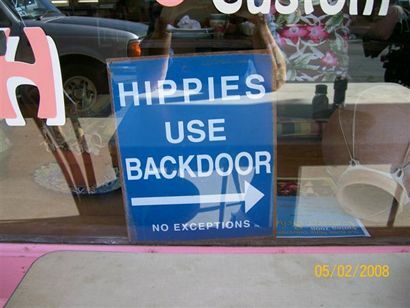 Does any of my readers out there know of other “hippies”? Maybe there are some I haven’t thought about. If you think of others, please clue me in.